Skilled as a hunting and obedience dog, the Vizsla is full of energy and does great with kids! Vizslas are loving and gentle pets, and they can be trusted with children. If they are well socialized when young, they are good with strangers too, but they should not be trusted with small pets. The Hungarian Vizsla makes a wonderful companion for active types. They are rather easily distracted though, so training will take some patience. When selecting a Vizsla, look for hip dysplasia, thyroid and digestive problems, eye deformities, and epilepsy. 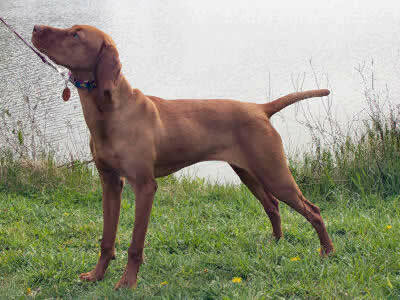 Breed Type The Vizsla is a sporting breed from Hungary. A pointer, the Vizsla is skilled at hunting and obedience. Background The Vizsla originated in Hungary, and is believed to be a descendant of the Transylvanian hound and the Turkish yellow dog. It has been used in the development of several other modern breeds, including the Weimaraner. The Vizsla nearly became extinct after World War II due to its ties to aristocrats, but was rescued through smuggling. Popular hybrids include the Labrala, a cross between the Labrador Retriever and the Vizsla. Description Vizslas are sleek and strong. They have short, rust-colored coats, long muzzles, long pendant ears, and light eyes and noses. Their tails are docked where permitted. Males are 22-26 inches tall and weigh 45-60 pounds. Females are 40-45 inches tall and weigh 40-55 pounds. Care and Feeding Vizslas' diets should consist of foods that t include poultry, wheat, barley, rye, pork, and beef. Regular brushing and occasional dry shampooing are all that is required to keep your Vizsla looking great. Baths should be given as needed, and nails should be trimmed regularly. The Vizsla's tail is usually docked to two-thirds of its original length at 1 to 3 days of age. The Vizsla sheds moderately, but its fur usually does not cause allergic reactions. Regular vacuuming is necessary if kept inside. Housing Your Dog Vizslas should be kept outdoors, or should have plenty of space if kept indoors. They need a reasonably large yard to play in. Social Behaviors Vizslas do well with children, and are friendly toward strangers as long as they are properly socialized. They get along with other dogs, but generally should not be trusted with small pets. Handling and Training The Vizsla is easily distractible, and this can cause problems when training. Obedience training is important, and it must be done firmly. Activities Exercise is very important for Vizslas. They need a long daily walk and ample opportunity to run off-leash. Breeding/Reproduction When selecting a Vizsla, check bloodlines for digestive problems, skin problems, hip dysplasia, thyroid disorders, and epilepsy. Common Health Problems Vizslas are generally a healthy breed, but they do sometimes inherit illnesses. These include eye deformities, epilepsy, hypothyroidism, and hip dysplasia.. Availability Vizslas are difficult to find in some areas, but breeders may be located online. Prices are usually $600 to $800. My Vizsla Makes the strangest noises and will most of the time in a way talk to me. When she 'talks' she sounds like the you tube star Miska the husky. Hi I have just got a viszla. The first 2 days she was great, now she doesn't want to go out and walk, can u help me, whats up with her. Thanks for this advice. It seems this advice is common. My only worry is can i feed my Visla Puppy oily fish as a family member has a German Pointer and swears by it.